Gigapolis Zone (called Gigalopolis Zone in the Japanese "Sonic & Tails" version, and the Master System port), is the second zone of Sonic Chaos for the Sega Game Gear and Master System. In keeping with the other stages of this game, Gigapolis consists of two standard Acts followed by a shorter, third Act which contains the Zone's boss. This level sees Sonic run through an urban environment at night, under the stars. Some of the level resembles a construction site, with orange, metal frameworks and seemingly incomplete block walls. The background displays various high-rise buildings as well. 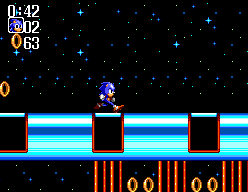 This zone also introduces the 3/4 loops in the Game Gear series, which were first shown in Sonic the Hedgehog's Star Light Zone. Indeed, and since both games take place on South Island, it would not be unreasonable to speculate that Gigapolis and Star Light Zone are close neighbours. Gigapolis is one of the only zones in Sonic Chaos to have two different music tracks for the Game Gear and Master System ports respectively. Dokabuton — Helmet-Beetle robots similar to Moto Bugs. This page was last edited on 28 September 2018, at 07:36.